The days of fixing a car based on your own skill and experience alone are over. You’ve got to reference and follow the OEM procedures every time. This was stressed over and over by experts in such diverse fields as scanning, joining, steel and aluminum Thursday at the Society of Collision Repair Specialists OEM Collision Repair Technology Summit at SEMA. “Intuitive repair intellect” just won’t cut it, according to Marks. “You can’t assume anything anymore,” he said. And it’s not even as simple as printing out the repair procedures once a vehicle generation or model year and waiting until they pop in on your estimating service, OEMs indicated. You might get major changes in internal composition (stronger structural elements, for example) or revised repair procedures at mid-cycle redesigns, monthly or even daily. We’ll discuss the topic further with our in-depth coverage of the individual forums. But here’s an analogy from medicine to get you started. Would you want to go to a doctor who didn’t keep current on prescriptions or best practices? Of course not. And that doctor has it easy. Human skeletal structure hasn’t changed for tens of thousands of years. Auto bodies are changing sometimes from year to year. Panelists frequently pointed to the OEM One Stop site, a fantastic automaker collaboration similar to the I-CAR Repairability Technical Support portal. It directs repairers to exactly where they can find the right information. Some OEMs require subscriptions for collision details, others don’t. If you don’t want to pony up for the subscription or understand what the procedures say, don’t work on it. If you did your due diligence and there’s still no OEM procedure for whatever specific situation you’re encountering, panelists had a few suggestions. Use an OEM or I-CAR general best practice for that vehicle’s model year from the most recent set of repair procedures. (Remember, this can change quickly.) 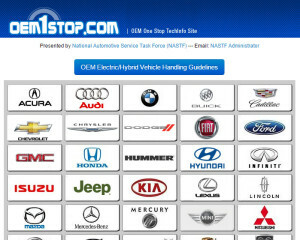 Contact OEM hotlines yourself or though a dealership. Or ask I-CAR, which has a pipeline to automakers. Don’t guess. General Motors advanced service design engineer Mark Szlachta, one of the experts on fixing the aluminum and high-strength steel 2016 Cadillac CT6, observed that the technician of the past works on any car which comes in. The technician of tomorrow knows not to if his or her expertise isn’t up to it. “We have to put our egos aside,” Audi collision programs and workshop equipment specialist Mark Allen said.